Amateur Radio Training is for Everybody! Amateur radio training is all about gaining the skill and fascination for communicating using radio. Amateur radio is open to all, young or old. Amateur radio captivates the interest of millions of people around the world. Amateur radio operators, also known as “hams”, encompass a huge range of activities, from people communicating with someone down the street, right up to those talking to the International Space Station. Radio amateurs are at the forefront of developing technologies years in advance of when they are rolled out to the public. FM, television, and even mobile phones were all used by amateur radio operators many years ahead of the public. Hams are at the very cutting edge of technology in many areas. Radio amateurs often assist by providing communications after disasters and emergencies. Many radio amateurs use the same skills to provide reliable communications for fun runs, carnivals, village fetes and air shows. There are also fun amateur radio competitions and awards and much, much more. If you want to do something challenging, fascinating and worthwhile, become a radio amateur! These must be passed in order. At RADARS, examinations are arranged “on demand” rather than running courses at specific times. Rather than run courses, we carry out Foundation and Intermediate training in small groups, or on a one to one basis, as our experience has shown that candidates prefer this approach. For the Advanced examination, we expect students to self study and revise on their own, though guidance and discussion sessions are always available. 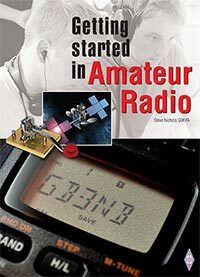 “If you want to know something about the hobby or are newly licensed, or are even just looking for something different, Getting Started in Amateur Radio provides the answers. What about receiving digital images from the International Space Station? Or talking to friends around the world via satellite? Or perhaps being able to help out during natural disasters? All of these things are possible with amateur radio and Getting Started in Amateur Radio details these and many other possibilities. Getting Started in Amateur Radio provides information on the activities to explore when using your first VHF/UHF or HF station and what other equipment you might need. There is a section on practical antennas vital to every radio amateur and details of operating using CW (Morse code), FM, SSB, Digital and more. What you can expect from the different amateur radio bands is covered and there is even a section devoted to long distance operation (DXing), amateur radio contesting, and amateur radio awards. The coverage doesn’t stop there and readers will also find the microwave and LF bands discussed along with Moonbounce or Earth-Moon-Earth transmissions (EME). There is even a practical guide to getting a licence if you don’t already have one.